“I said there must be some Toros in the atmosphere”. Oh yes, I’m currently watching Bring It On whilst writing up this post. Winter to me is like a trial and error phase, buying things that will hopefully keep me warm then not return it if they fail on first impression. Wearing my signature oxblood coat since late autumn, it didn’t keep me warm as I had wanted so I had to venture for a new one. I get cold easily, afraid and sensitive to it I would say. During the January sales, I had stumbled upon this Zara coat. When I had received the package, the coat looked like a duvet by the way it was folded and thought Zara was pranking me. I was surprised that it wasn’t fully lined with the oh so soft fur, just the hood and lapels. The coat is thinner than I had expected, however, the quilted lining is just perfect and warms me to the point I may KO at times at work, it’s that comfortable. The perfect coat. Another must need piece is a scarf. This Zara scarf is like a blanket to me, it’s that big and oversized keeping my lower face warm. Beanies are my to go. Bed head, greasy hair, hair disasters, a beanie just resolves everything. This ones from H&M 2 years ago and have been constantly wearing it. I can’t go a day without using lip balm. The Lanolips Lip Ointment with Colour (not pictured) is my go to lip balm. Thick enough to prevent my lips from cracking plus adding a hint of colour. I will be doing a full review of this very soon. What items have been your winter essentials? you're so beautiful omg, xo! Such a cute outfit!! I totally forget you guys are in winter, currently summer for us in Australia. Scarves, coats and gloves and hats!! This year I have relied on my oversized blanket scarf from ASOS. So warm and snuggly and one of those big pieces that you can just wrap around you in any old fashion and it looks great! love scarves! and the coat! we don't get to wear coat here much! Considering we have below minus 20 temps quite a bit throughout our Canadian winter I consider my wool coat and scarf, hat and mitts to be very essential! Scarf can really keep you warm and also prevent you from having colds. Lip balm would also help reduce wind burns during the cold months. I wish I'd experience winter too. Here in my place right now our AC is turned on because it's so hot. Well, someday, I'm gonna build a snow man! Winter 101! haha Great pick of wears for winter! Suits you best! Never experienced winter cause we live in a tropical country. But yours seems fit for the winter. Fancy coat. That coat looks really comfortable to wear. Love your hair color btw! That coat, I heart it! I love your Zara's coat and scarf, they make winter a pleasant experience, looking so fancy and with inimitable style! I always think winter wear is very cool.. Just don't have the chance to wear it in the country I'm living in.. I wish I could collect coat myself. But the weather in the Philippines is just impossible. I like the style of the coat though. That's a really good ensemble you've put together. The coat and the scarf match well and look comfortable and warm. Those are a must during winter. I just came from a winter place. I just had thermal underwear and multi- layering of thin coats/sweater. No really thick and heavy coats, yet I survived the 0 degree temperature. Aside from that, scarf, gloves and beanie should be enough. You look ready to conquer the winter winds out there. Today is one of our coldest days. Your outfit would be perfect. I love your coat! 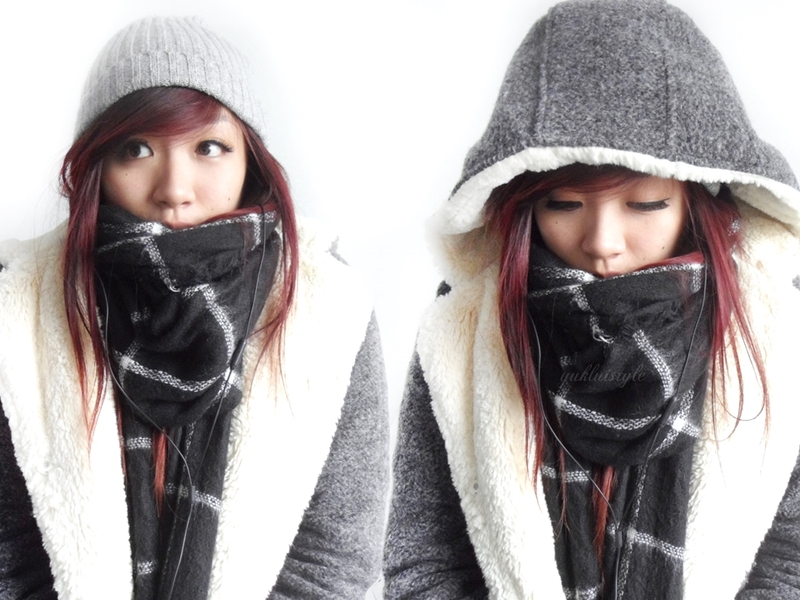 Looks very stylish on you ^^ Unfortunately, we don't have winter here in our country. You do look really cosy! Hat, scarf and gloves for me! Scarf, hat, warm coat – check! I cannot wait for spring, I am dying for it! Love Zara's winter coats! I have one that has a soft shearling lining that is detachable so the coat can be worn on warmer weather. Your winter look is great btw, so chic!